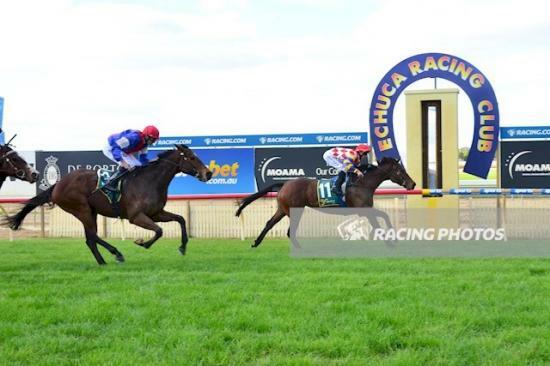 The Heavy 10 conditions at Echuca proved no problem this afternoon for Za Za Zoom in the ERC Membership (BM64) Handicap over 1400m with Mornington-based trainer Tony Noonan never in doubt. “It’s a long way to come to Echuca from Mornington but this mare’s entire prep has been designed to be racing on these surfaces,” Noonan said. “It’s a great result for Nigel Berry and his group of owners who have so much faith in this mare. Jumping well from barrier 6 in the field of 10 under apprentice Mitchell Aitken, the 5-year-old Strategic mare settled midfield behind a good tempo. Upon straightening, young Aitken elected to play for luck by sticking to the inside as the field shifted towards the centre of the track as he got the saloon passage through, confident Za Za Zoom would have no issues getting through the worst part of the tack. Hitting the front at the 150m mark, Za Za Zoom ($8) kicked clear before being eased on the line to score from Spunlago ($5.50) by a length with Smooth Consul ($4.80) a further length back in third. The win was Za Za Zoom’s fourth of her career with Noonan confident there are more to come as his mare gets further into Winter.